On May 9, eight S-400 air defence missile launchers will participate in the parade on Red Square in Moscow in honour of the 69th anniversary of victory in the Great Patriotic War. Combat crews from the Zvenigorod Air Defence Missile Regiment, equipped with the S-400 ‘Triumph’ Air Defence Missile System have taken up their duties defending the air space over Moscow, after training on the ‘Tembr-M’ simulator. 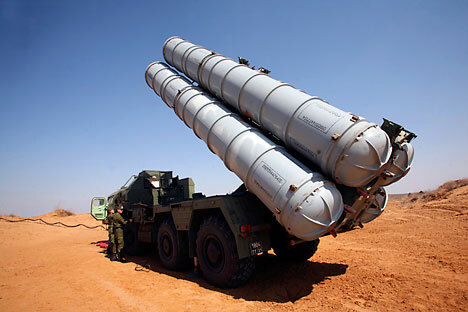 The principal objective of the air defence missile regiments, as part of the Aerospace Defence Forces is the air defence of Moscow and the country’s Central Industrial District, as well as protecting the upper echelons of military and state command, industry and power engineering. They also protect alignments of forces and transport links from potential enemy air strikes. “The Aerospace Defence Training Regiment, located in the suburbs of Moscow, is designed to bring the training of combat crews in air defence missile regiment command posts and S-300 and S-400 batteries up to date. This is to enable them to perform combat operations in a complex aerial environment using actual flights and the ‘Tembr-M’ simulator,’” Zolotukhin added. The unique nature of the ‘Tembr-M’ simulator, according to Zolotukhin, lies in its ability to model any combat environment in real time and in actual geographical dimensions. From the Moscow region specialists in the training regiment are able to train S-300 and S-400 combat crews from air defence missile regiments for operations in any corner of the globe, using a digital map of the locality. “Last year there were more than 30 tactical test exercises on the training regiment’s base. More than 70 combat crews from air defence missile regiment command posts and batteries were trained by regimental specialists, and around 1,000 personnel from the air defence missile forces underwent verification training,” Zolotukhin added.